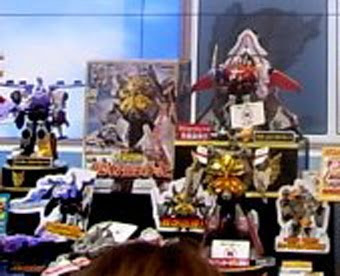 Toku Insider: Blurry pic of Ultimate from Toy Show, some info. Blurry pic of Ultimate from Toy Show, some info. GoseiUltimate, (and probably Ozu and some Xros Wars toys as well) were marked with a Do not Photograph sign. But there it is regardless. I have to say, even with this bad quality pic, he looks pretty sweet. Original coloration. I'm still hopeful for a cluster-gattai, but I'm not holding my breath. At the very least, we get 3 Super Gattai, each very different from the other. I.e., the Miracle Headders will first show up as Headders that are out of control. This follows the pattern of both KyouretsuOh and MogyuuDaiOh, who both first appeared as uncontrollable super mecha. I assume when they are controlled, the Goseiger will be granted Super Form. This'll happen in the August episodes, and yes, the name "AbareHeadders" is confirmed. But... wha? Any word on that? Because if its true then what will Bandai release for Oct/Nov?